Best movie I've seen in a long time. Definitely worth the rental if you didn't have time to see it at the cinema. Very smart, and well done. Would watch it again. Not sure why other's rated it so low. Excellent movie, held my attention from start to finish. 1st half was good, last half was just horrible. The ending was the worse I have ever seen. Looked like it was edited by a 1st year film student. It was a good rental. This movie deserves a star like George Clooney deserves a Lifetime Achievement Award. Excellent movie. It was creative and deserves a 5 star. This movie needs to be watched first before its judged in a negative way. Waste of money and my time. I didn't like it and my husband wanted to leave during the movie. Only the popcorn was good. Why did I go? It should be rated 0 stars really. It's a thriller, but I wasn't prepared for the senselessness of it and the bad acting of the female actors. Very boring, and without taste or character. Don't spend your precious time or money on it, if you have to, wait for home viewing. What now Hollywood? Such a waste of people's time. Why???? very bad movie, don't waste your money. we left before the end, as many others did. What a brutal waste of time. So much character development thrown out of the window. That's 2 1/2 hours of my life I'll never get back. Brilliant. Hard to Predict. Every scene was a surprise. I love that. The ending was also brilliant. For those who find the ending unsatisfying, I can see how some might find it implausible. For me the ending was very plausible. It's difficult to say why without being a spoiler. Rosamund Pike is stunning and convincing. My advice to guys -- see it with your pals or go alone. Don't take your wife or girlfriend. good movie until the last 25 min. could have ended with something more suitable. Awesome movie, very entertaining and suspensful...thumbs up! Loved the movie. Was reading the book and stopped with the last 100 pages...glad I did because it would have ruined the movie. Did not like the ending. I prefer a definite ending. 4.5/5.0 This movie only gets better as it develops. Great plot! Awful, don't waste your money or time. Very good. Psychotic. Some scenes are graphic and some hard to believe. Agree with previous reviews that Doogie Howser seems out of place in this role. Found the ending very disappointing. I did not enjoy this movie. The trailers did not prepare me for what I saw. This movie was excellent until the ending. Worth seeing but it seems most agree the ending was crap. I don't want to give anything away, but I will say character believability and motivation is what really goes missing in this movie. Loved it! I really like phychological thrillers this the best one in a long time. Great thriller, with several unexpected twists throughout the story line that finally ended quite strangely. I enjoyed it. By far, one of the worst movies I've seen in a while, to long ending was brutal, don't waste your almost 3 hours if your life!!!! I have an imagination and would have used it , the smute and launguge , was Not nessary and we walked out.. ruined it for us... could have been a good story as the trailer makes it out to be. Terrible. Complete waste of time and money. Ending was crap. Pretty decent. It seemed like a kind of mish-mash of previous thrillers: Sleeping With The Enemy, Basic Instinct, Jagged Edge, and Fatal Attraction. Still, it had its own story and some decent twists, along with a few red herrings. Love the movie Ben was great in it. Disappointing! Acting was fair but the story was slow and plodding. The ending leaves a lot to be desired! REALLY GOOD. A MUST SEE. This movie was full of suspense and had multiple twists. It was very entertaining. I could not predict the ending! A must see for movie goers who enjoy thriller suspense flicks! Movie has it's good and bad moments. Previous reviews say wait for DVD - I agree. Complete waste of time & $17.00. Had potential in the beginning but the story became too far fetched. It was about 30 min too long, couldn't wait to leave the theatre. Roughly 2.5 hours of twists, with no closure. Great movie kept you thinking which direction it was going to go, very entertaining. 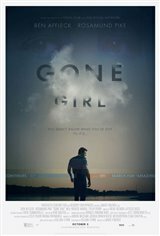 In the end it went nowhere which was lame after investing time in the movie, what a shame as there were so many ways it could have ended, unless it is simply leaving room for a gone girl 2! solidly awful!!! Don't waste your time and money!!!! !